The process begins with lots of questions and discussion. Depending on the size of the work there may be some sample sketches or some painted studies on paper. Then I work away at creating your personalised artwork for you. Please note there may be a waiting list for commissioned works. Below are some examples of completed landscape commissions. The brief for this commission was to create a forest scene that enveloped the viewer, creating a sense of peace and calm in the living space, while at the same time beckoning adventure in a deeply layered and dense image. I worked closely with the client to develop the colour palette and get the composition just right. It was a joy to work on this scale. 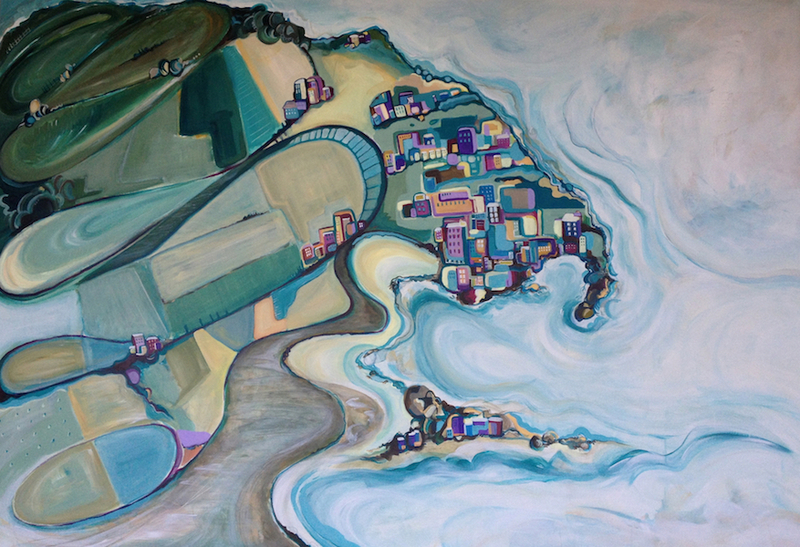 The focus of this piece was not the specific landmarks or accuracy in depicting the Italian coast, but in re-creating the feeling of a meaningful holiday, the general mood of the place, and the memories associated with the clients visit. We spent time talking about the meandering walking paths through the hills, the luscious greenery hidden away just behind the coastal village, and the fresh openness of the ocean views. After some sketches and a handful of painted studies, there was a clear winner, and the process was underway! A bright and cheery imaginary landscape for this coffee cart, incorporating some of the lines, shapes and motifs from my earlier work.